In the first attempt to block an access road to the Suwannee American Cement kiln being built 3.5 miles from the Ichetucknee River, activists with Ichetucknee Earth First! on October 22 placed an immobilized camping trailer with 4 people locked down inside on the roadway leading to the construction site. By 10 p.m. all four, including one with his arm through a hole in the floor and locked inside a pipe cemented in the road, were cut out by fire rescue workers and arrested by police. This ended the 16 hour road block. Ichetucknee River defenders planted a trailer in one of the entrances to the building site where a cement plant is planned. The road block was put in place early Sunday morning and was received well by the local community, which largely is opposed to the cement kiln because of concerns it will pollute the air and drinking/irrigation water, disrupt the river ecosystem and hurt local economy. Suwannee County Sheriffs Dept. made several visits to the scene through out the day, but made their final visit at dusk, along with paramedics and rescue workers. After police asked all people to leave the trailer, they entered and announced that all those not willing to leave would be arrested. Of course none were willing to leave. In response to that, the police then put plastic handcuffs on their arms and legs and then used a pneumatic bolt cutter to break the U-locks around their necks. After three of the protesters were cut out and taken to jail, the workers then spent over an hour cutting out the person with his arm down in the "dragon." The workers had to cut part of the floor out and then dig and chisel away the limestone and cement to get his arm out of the PVC pipe cemented into the road. Suzanne Morris and Oliver Moore locked themselves to two others inside a trailer blocking access to the cement plant site on October 22. Suwanee County officials disassemble the trailer road block. Four Earth First! members were arrested in the action. 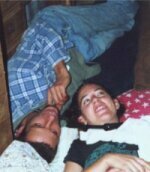 They had locked themselves to each other and one member was attached to a pipe cemented in the road. The four people arrested all pled not guilty and all have requested a trial by jury. On Nov. 21st they received a pre-trial date which is Jan.16th. Their court date is set for Jan 25th. They have requested that they be tried together. The purpose of the action was to have a presence on the site to rally people from the community to join in and block access to trucks. EF! demands that Gov. Bush revoke the building permits on the grounds that the pristine Ichetucknee River is an Florida Outstanding Water Way and deserves full protection. Part of the deal between Suwannee American Co. and the state calls for the company to clean up its old contaminated sites, turn over a new "environmental leaf" and comply with state policy. If this company, which is notorious for noncompliance and environmental degradation, continues its policy of not complying to state law, authorities from the Dept. of Env. Protection can revoke the permits. Many people working on this issue feel that there is evidence that the company has already broken laws and agreements pertaining to the cement plant deal, so technically the state can revoke the permits, but to date has refused to do so. One such instance occurred in September at a separate Anderson Columbia road paving project in North Florida, where they were caught by the DEP degrading a wetland that they had agreed not to disrupt. Cement kilns are among the dirtiest industrial polluters in the world. Cement kilns inefficiently burn millions of tons of coal and tires to make Portland cement. This process will emit 94 pounds of mercury annually, along with dangerous amounts of phosphates, carcinogenic dioxins and fine particulate matter. This kiln will put toxic pollutants into the air and water. To make things worse, there are three endangered species--the Florida Manatee, the red-eyed-blind crayfish and the rare silt snail--which inhabit the area near the cement kiln. 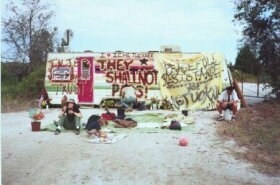 There will be a major civil disobedience action at the kiln site on January 15th 2001 (Martin Luther King, Jr.'s birthday) to bring more attention to the issue which will be represented in the Florida State Court the following week with an appeals case by Florida Attorney General Bob Butterworth (D). Butterworth opposes the kiln and is aiming to halt construction and get the permits revoked. The newly formed Ichetucknee River Coalition will be staging a demonstration in support of Butterworth's argument at the hearings. NO COMPROMISE IN DEFENSE OF THE ICHETUCKNEE RIVER!